In contrast to the role of dendritic cells (DC) in immunity and tolerance, little is known about their possible role in the resolution of inflammatory processes. In addition to the reduction in the number of infiltrating immune cells, the elimination of effector T cells already present at the inflammatory site represents an essential step toward resolution. Recently, lipid mediators such as the omega-3 fatty acids eicosapentaenoic acid and docosahexaenoic acid and their metabolites, including resolvin E1 (RvE1), have been shown to accumulate in inflammatory foci during the resolution phase. RvE1 has been reported to reduce immune cell infiltration and proinflammatory cytokine production. 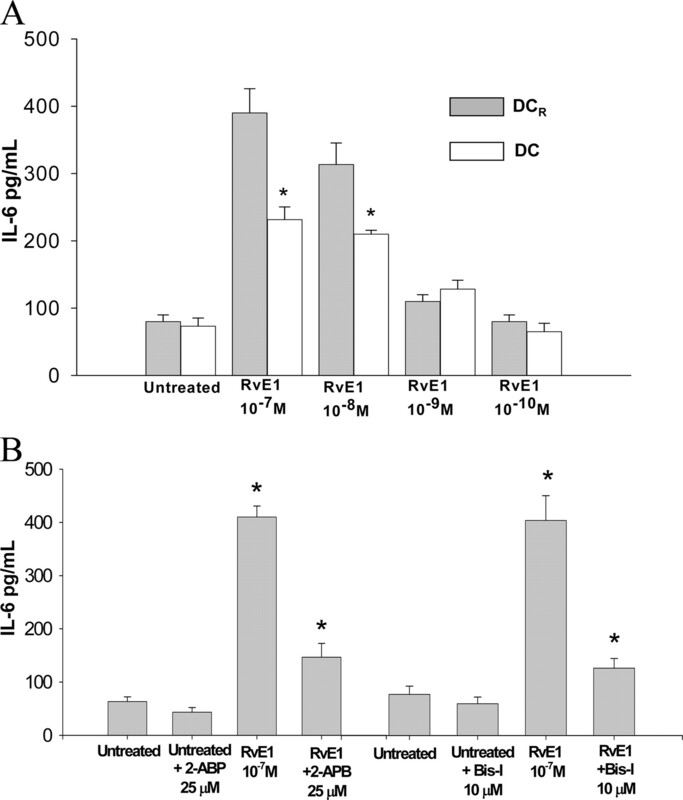 In this study we report that DC exposed to RvE1, especially during differentiation, acquire the capacity to induce apoptosis of activated T cells through the induction and activity of indoleamine 2,3-dioxygenase. To our knowledge, this study is the first to report on an omega-3 fatty acid derivative inducing indoleamine 2,3-dioxygenase expression in DC. RvE1-exposed DC maintain an immature chemokine receptor expression pattern even following TLR stimulation, with high CCR5 and no CCR7 expression. This effect implies that DC exposed to RvE1 and pathogens remain at the inflammatory site, instead of migrating to lymph nodes, and induce apoptosis in effector T cells infiltrating the inflammatory site. To our knowledge, the DC described in this study represent a new functional DC subtype, whose essential function resides in the resolution of inflammation. Bioactive lipids generated from both omega-6 and omega-3 fatty acids play an important role in inflammatory processes (1). In contrast to prostaglandins and leukotrienes, which are mostly proinflammatory, products of the omega-3 essential fatty acids such as resolvins and protectins play an essential role in the resolution phase, promoting termination of the inflammatory process (2, 3). The anti-inflammatory properties of omega-3 essential polyunsaturated fatty acids such as eicosapentaenoic acid (EPA)3 and docosahexaenoic acid (DHA), found in high amounts in fish oil, have been recognized for several years. Some of the chronic inflammatory diseases in which omega-3 fatty acids are considered beneficial are lung fibrosis, cardiovascular disease, and rheumatoid arthritis (4, 5, 6). Resolvin E1 (RvE1), a strong anti-inflammatory lipid, is an omega-3 fatty acid metabolite of EPA (7, 8, 9, 10, 11, 12). Recent studies indicate two different pathways for the generation of RvE1, an aspirin-dependent pathway that involves transcellular conversion of EPA by an aspirin-acetylated cyclooxygenase (COX)2 in vascular endothelial cells followed by the effect of polymorphonuclear cell (PMN)-derived 5-lipoxygenases, and an aspirin-independent, microbial or cell-derived cytochrome P450-initiated conversion (11, 13). The latest biosynthetic pathway represents a significant source of RvE1 at the level of gastrointestinal epithelial tissue populated with numerous prokaryotes. RvE1 has been shown to be protective in models of colitis and periodontitis by reducing PMN infiltration and proinflammatory mediators such as TNF-α, IL-12p40, and inducible NO synthase (14, 15, 16, 17). In addition, RvE1 stimulates neutrophil clearance through a CD55-dependent mechanism (18). Dendritic cells (DC) are a heterogeneous population of widely distributed hematopoietic cells specialized in Ag capture, processing, and presentation to T cells (19, 20, 21, 22). Interaction of naive T cells with DC results in either T cell activation or tolerance (reviewed in Refs. 23, 24, 25, 26). In comparison with the role of DC in initiating an immune response and inducing/maintaining tolerance, much less is known about the possible DC role in the resolution of an inflammatory process. One of the major mechanisms in the resolution of an inflammatory process is the deletion of effector T cells. Anti-inflammatory DC could play an important role in this process through expression of indoleamine 2,3-dioxygenase (IDO), an enzyme involved in tryptophan catabolism. Following IDO activation, tryptophan depletion inhibits T cell proliferation by inducing cell cycle arrest, and tryptophan metabolites such as kynurenine, 3-hydroxykynurine, and 3-hydroxy-anthranilic acid are cytotoxic for effector T cells (reviewed in Refs. 23, 27). Little is known about endogenous factors that induce IDO expression and activation in DC. For human monocyte-derived DC, IFN-γ and combinations of PGE2 and TNF-α or TLR ligands were shown to induce IDO activity (28, 29, 30). It is not known whether omega-3 fatty acids or their metabolites induce IDO expression in DC or whether they contribute to the generation of anti-inflammatory DC with the capacity to inhibit the proliferation and function of effector T cells. In the present study, we investigated the effect of RvE1 on differentiating DC in terms of phenotype and function, i.e., expression of costimulatory molecules, IDO, chemokine receptors, cytokine production, and effects on effector T cells. Synthetic RvE1 was purchased from Cayman Chemicals. Capture and biotinylated Abs against murine IL-4, IL-10, IL-6, IL-12, TNF-α, TGF-β1, IFN-γ, CD40, CD4, Vβ3, CD11c, I-Ek, CD80, CD86, and recombinant murine IFN-γ and recombinant murine IL-4 were purchased from BD Pharmingen. CCL21, CCL19, CCL3, CCL5 and CXCL12, IL-4, IL-10, IL-6 were purchased from PeproTech. Pigeon cytochrome c fragment (PCCF) was synthesized and purified by Invitrogen. Bisindolylmaleimide (Bis I) and 2-aminoethoxydiphenylborate (2-ABP) were purchased from Calbiochem. LPS (from Escherichia coli O55:B5), OVA, and 1-methyl-l-tryptophan were purchased from Sigma-Aldrich. B10.A (I-Ek) mice were obtained from The Jackson Laboratory. TCR-Cyt-5CC7-I/Rag1−/− transgenic (Tg) mice (I-Ek) were purchased initially from Taconic Farms, followed by breeding in the animal facility at Temple University. All mice used were between 7 and 12 wks of age. All animal procedures were approved by the Temple University Institutional Animal Care and Use Committee in accordance with American Association for the Accreditation of Laboratory Animal Care guidelines. Bone marrow derived-DC were generated from B10.A mice in medium containing (20 ng/ml) recombinant murine GM-CSF in the presence or absence of RvE1 (10−7 M). On day 6 or 7, nonadherent cells were collected by gently pipetting and centrifuged at 200 × g for 5 min. Cells were analyzed by flow cytometry or seeded in flat-bottom 24-well microtiter plates from Corning at 1 × 106 cells per well in a final volume of 1 ml and matured for 48 h with LPS (100 ng/ml). CD11c+ DC were purified with anti-CD11c immunomagnetic beads and the MidiMACS Separator (Miltenyi Biotec). Purified CD4+ T cells from Tg mice were isolated by positive immunomagnetic selection with anti-CD4-conjugated magnetic beads (Miltenyi Biotec). The purified T cells were >97% CD4+ by FACS analysis. Splenic DC were isolated from pooled spleens by using anti-CD11c immunomagnetic beads (purity 97–98%). Bone marrow DC (1 × 106 cells/ml) were incubated with various mAbs (FITC anti-CD80, anti-CD86, anti-CD40, and anti-I-Ek and PE anti-CD11c, 2.0 μg/ml final concentration; BD Pharmingen) at 4°C for 30 min. The PE anti-TLR4 Ab was purchased from Santa Cruz Biotechnology and used at a concentration of 1 μg/ml. Isotype-matched Abs were used as controls, and IgG block (Sigma-Aldrich) was used to block nonspecific binding to Fc receptors. Washed cells were fixed in 1% paraformaldehyde. Stained DC, gated according to forward and side light scatter characteristics, were analyzed on a FACSCalibur or FACSCanto flow cytometer (BD Biosciences). Fluorescence data were expressed as geometric mean fluorescence, and as a percentage of positive cells with higher isotype-matched fluorescence values. Mouse regulatory T cell (Treg) Foxp3 expression was determined using the mouse Treg staining kit (eBioscience). Staining and permeabilization were conducted per the manufacturer’s instructions. Mannose receptor-mediated endocytosis was measured as the cellular uptake of FITC-dextran (Sigma-Aldrich) and was quantified by flow cytometry. Briefly, DC (5 × 105 cells/sample) were incubated in medium containing FITC-dextran (1 mg/ml; molecular mass 40 kDa) for 2 h at 4°C or 37°C. Subsequently, incubated cells were washed and fixed in cold 1% paraformaldehyde, and analyzed by flow cytometry. Ag-activated T cells were generated from TCR-Cyt-5CC7-I/Rag1−/− Tg (I-Ek) mice. Purified PCCF-specific Tg CD4+ T cells (5 × 105 cells/well) were stimulated with syngeneic (B10.A) bone marrow-derived DC (5 × 104 cells/well) pulsed with PCCF (5 μM). After 3 days of culture, T cells were recovered by CD4+ immunomagnetic positive selection. Purified activated T cells were rested for 2–4 days in complete medium supplemented with 50 IU/ml of IL-2. 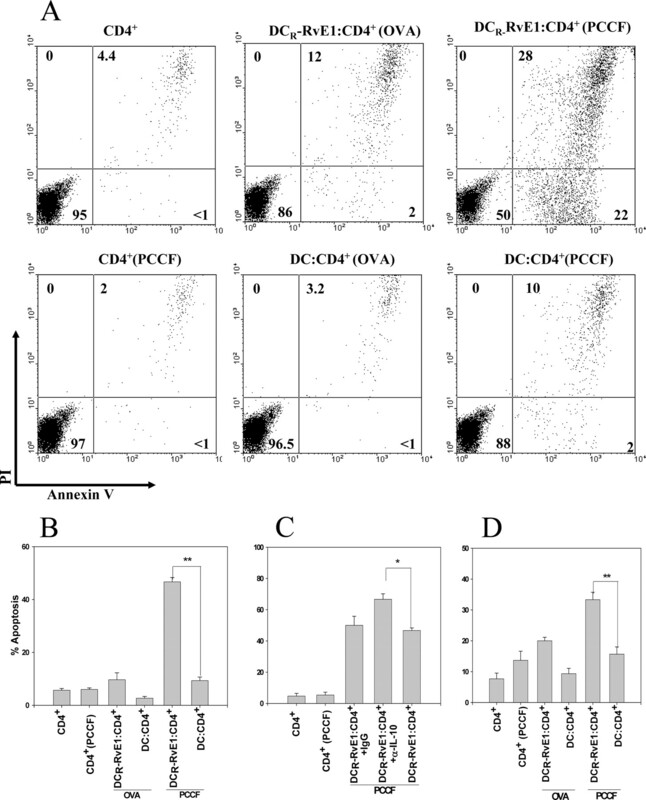 Various numbers of B10.A bone marrow-derived DC differentiated in the absence or presence of RvE1 and matured with LPS were pulsed with PCCF and added to purified Tg CD4+ effector T cells (5 × 105 cells/well). Proliferation was determined by measuring BrdU incorporation as recommended by the manufacturer (Roche Applied Science). Cells cultured with an irrelevant Ag (OVA, 10 μg/ml) were used as control. Cell-free culture supernatants were harvested and used for cytokine determination by ELISA. The cytokine content in DC to T cell culture and DC culture was determined by sandwich ELISA, according to the manufacturer’s protocol. The Ab pairs used were as follows, listed by capture/biotinylated detection Abs (BD Pharmingen): IL-4, IFN-γ, IL-12p70, TNF-α, IL-6, IL-10, IL-17, and TGFβ. Absorbance readings were taken at 450 nm using a Bio-Rad Benchmark plate reader. DC to CD4+ cultures were washed and adjusted to 1 × 106 cells/ml in staining buffer. Annexin V and PI staining was performed as recommended by BD Pharmingen and the cells were analyzed immediately by flow cytometry. Lymphocyte gating was used to exclude DC. On day 7, control DC and DC generated in the presence of RvE1 and re-exposed to RvE1 for 24 h after harvesting of nonadherent cells (DCR-RvE1) were resuspended in RPMI 1640 medium with 0.25% BSA (Sigma-Aldrich). Cells (5 × 105) were added on top of a Transwell culture insert with a 6.5 mm diameter and 5-μm pore size (Corning). The secondary lymphoid-tissue (200 ng/ml) and EBI-1 ligand (200 ng/ml) chemokines, and stromal-derived factor-1α (100 ng/ml; all from PeproTech) were added to the lower compartment of 24-well plates. The number of cells migrated to the lower chamber within 5 h was determined. Chemokine receptor mRNA expression was assayed using total RNA isolated from DC stimulated in various conditions. Ultraspec reagent was used according to the manufacturer’s instructions (Biotecx Laboratories). cDNA was synthesized from 1 μg of total RNA, oligo(dT)18 primer, 200 U of AMV (Avian Myeloblastosis Virus; Promega). The following primers were used for chemokine receptor expression: CCR5 5′-CAT CGA TTA TGG TAT GTC AGC ACC-3′ and 5′-CAG AAT GGT AGT GTG AGC AGG AA-3′; CCR7 5′-CCA GGA AAA ACG TGC TGG TG-3′ and 5′-GGC CAG GTT GAG CAG GTA GG-3′; and β-actin 5′-GTG GGA ATT CGT CAG AAG GAC TCC TAT GTG-3′ and 5′-GAA GTC TAG AGC AAC ATA GCACAG CTT CTC-3′. cDNA levels were semiquantified by inclusion of an β-actin control. PCR was performed at 94°C 30 s, 55°C 30 s, and 72°C 30 s for 28 cycles, followed by 10 min elongation at 72°C. PCR products were separated on a 1% agarose gel and analyzed using a Kodak Image Station 440cf (Eastman Kodak). Cell lysates were prepared from 2 × 106 DC using Protein Extraction Reagent (Pierce). Quantification was conducted using the Bradford method. Cell lysates (25 μg of protein/lane) were separated on 10% SDS-PAGE, followed by transfer onto a polyvinylidene fluoride membrane (Bio-Rad). Blocking with TBST 3% skimmed milk for 60 min at room temperature was followed by detection of IDO protein with a mAb (1/500; Santa Cruz Biotechnology) and goat anti-mouse IgG-HRP and visualized by chemiluminescence using the Immune-Star kit (Bio-Rad). To assess the impact of RvE1 on DC development, we derived DC from B10.A bone marrow cells in the presence or absence of RvE1 for 6 days. The nonadherent cell population was harvested and stimulated with LPS for 24 h. The following four groups of DC were generated: 1) regular DC generated in the absence of RvE1 (DC); 2) DC generated in the absence of RvE1 and treated with RvE1 for 24 h after harvesting of nonadherent cells (DC-RvE1); 3) DC generated in the presence of RvE1 (DCR); and 4) DC generated in the presence of RvE1 and re-exposed to RvE1 for 24 h after harvesting of nonadherent cells (DCR-RvE1). The four types of DC were characterized in terms of CD11c, MHC class II, CD40, CD80, and CD86 expression in the absence or following LPS stimulation. DCR and DCR-RvE1 expressed lower levels of CD40, CD80, and CD86 compared with DC (both in terms of percentage of positive cells and fluorescence intensity for CD40 and CD86, and in terms of fluorescence intensity for CD80) (Fig. 1⇓). This observation was for both LPS-treated and untreated cells. In contrast, DC-RvE1 generated in the absence of RvE1 and treated for 24 h with RvE1 did not exhibit significant changes in any of the tested surface markers in comparison to regular DC (Fig. 1⇓). These results suggest that exposure to RvE1 during DC differentiation is essential for the effects on the expression of costimulatory molecules. In terms of lack of costimulatory molecule up-regulation following LPS stimulation, DCR resemble at least one type of tolerogenic DC (31). RvE1 induces a stable immature phenotype in DC. A and B, B10.A bone marrow cells were differentiated in the absence (DC) or presence of RvE1 (DCR) for 7 days. On day 7, nonadherent cells were harvested and treated with medium (DC) or 10−7 M RvE1 (DC-RvE1 and DCR-RvE1) in the presence or absence of LPS (100 ng/ml) for 48 h, followed by staining with anti-CD11c, anti-I-Ek (MHC class II), anti-CD40, anti-CD80, or anti-CD86 mAbs and flow cytometry. Histograms are representative of three independent experiments performed in duplicate. C, Results are expressed as geometric mean fluorescence (GMF) ± SEM of three experiments performed in duplicate. ∗, p < 0.05 compared with DC; ∗∗, p < 0.01 compared with DC. The lack of response of DCR to LPS could be due to effects on TLR4 expression. DC and DCR were analyzed for TLR4 expression by FACS following culture for 48 h in the presence or absence of LPS. There were no significant changes in terms of percentage of TLR4+ cells and geometric mean fluorescence between DC and DCR in the presence or absence of LPS (data not shown). Immature DC are characterized by low expression of costimulatory molecules and high potential for endocytosis. We assessed the endocytic capacity of DC differentiated in the presence of RvE1 by measuring FITC-dextran uptake by DCR. At 4°C, as expected, there was no FITC-dextran uptake by either DC or DCR. In contrast, at 37°C, both types of DC exhibited internal FITC staining, with DCR being significantly more active in terms of endocytosis (Fig. 2⇓). RvE1 affects DC endocytosis. DC and DCR were assessed for endocytosis, using FITC-dextran medium incubated for 2 h at 4°C and 37°C, and flow cytometry. Histograms are representative of three independent experiments. Results are also expressed (bottom) as geometric mean fluorescence (GMF) ± SEM of three experiments performed in duplicate. ∗∗, p < 0.01 compared with DC. The cytokine profile of LPS-stimulated DCR and DCR-RvE1 was notably different from DC. 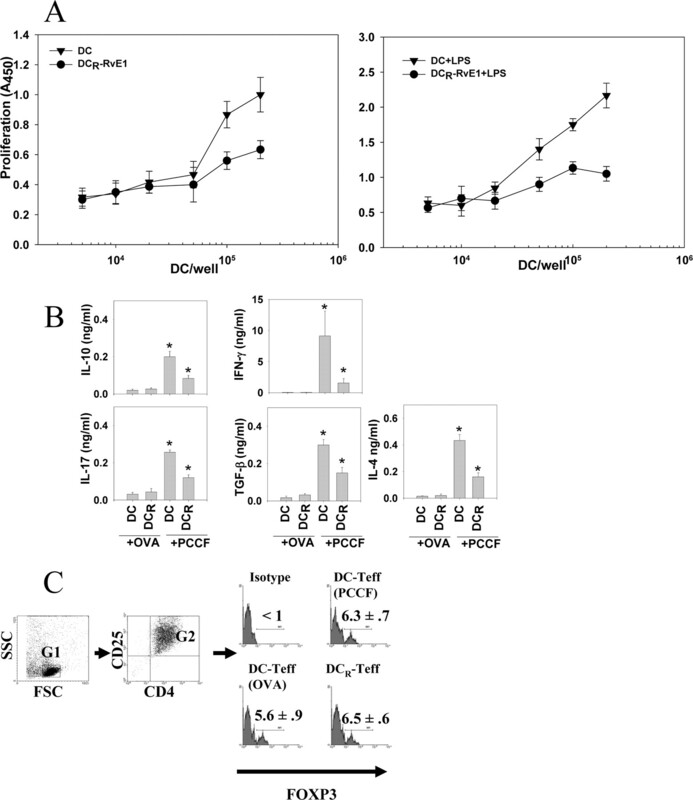 The secretion of the proinflammatory cytokines TNF-α and IL-12p70 was significantly lower in DCR and DCR-RvE1, whereas production of the anti-inflammatory cytokine IL-10 was up-regulated (Fig. 3⇓). Upon LPS stimulation, no difference was seen in the levels of IL-6 produced by DC or DCR, but there was a significant increase in DCR-RvE1 as compared with DC-RvE1 (Fig. 3⇓). Also, both DC-RvE1 and DCR-RvE1 produced low levels of IL-6 in the absence of LPS stimulation (Figs. 3⇓ and 4⇓A). RvE1 induces IL-6 release from DC/DCR in a dose-dependent manner. The levels of secreted IL-6 are higher in DCR-RvE1 compared with DC-RvE1 (Fig. 4⇓A). RvE1 affects DC cytokine profile. DC, DCR, DC-RvE1, and DCR-RvE1 were stimulated with LPS (100 ng/ml) for 48 h. Culture supernatants were assayed for secreted TNF-α, IL-12, IL-10, and IL-6 levels by ELISA. Results shown are mean ± SEM of three experiments performed in duplicate. ∗, p < 0.05 and ∗∗, p < 0.01. RvE1 induces IL-6 production in DC through specific receptors. A, DC and DCR were treated with different concentrations of RvE1, and IL-6 secretion was then assessed by ELISA 24 h later. Results shown are mean ± SEM of three experiments performed in duplicate. ∗, p < 0.05 between indicated groups. B, DCR were stimulated with RvE1 (10−7 M) for 24 h in the presence or absence of 25 μM 2-APB or 10 μM Bis-I (30 min pretreatment). IL-6 levels in supernatants were assessed by ELISA. The results shown are expressed as mean ± SEM of three separate experiments. ∗, p < 0.05 between indicated groups. The biological effects of RvE1 are mediated through ChemR23 and through the BLT1 receptor (32). These receptors have been reported to induce free calcium elevation and to activate protein kinase C. Therefore, we determined the effects of 2-APB (2-aminoethoxydiphenyl borate), a blocker of store operated calcium channels, and of Bis-I (bisindolylmaleimide I), a broad spectrum protein kinase C inhibitor, on IL-6 induction by RvE1. In both cases we saw a significant reduction of secreted IL-6 (Fig. 4⇑B). These results suggest that the stimulatory effect of RvE1 on IL-6 release from DC requires both calcium- and protein kinase C-dependent signaling pathways. Immature DC in the periphery express chemokine receptors that respond to proinflammatory chemokines such as CCL3, CCL4, and CCL5. Following the encounter with Ag, DC mature, undergo a change in chemokine receptors, and become responsive to chemokines constitutively produced in lymph nodes such as CCL19 and CCL21. As a result, mature DC migrate to the draining lymph nodes where they engage in Ag presentation with naive T cells. To determine the preferential localization of DC generated in the presence of RvE1, we assessed the ability of LPS-stimulated DCR-RvE1 to migrate in response to CCL19/21 and to CCL3/5. In contrast to mature DC, which migrate strongly in response to CCL19/21 and migrate little, if at all, in response to CCL3/5, DCR-RvE1 exhibit the opposite migration pattern (no migration in response to CCL19/21, and strong migration toward CCL3/5) (Fig. 5⇓A). We did not see significant differences in the migration toward CXCL12 (a lymphocyte chemoattractant used as control) between LPS-stimulated DCR-RvE1 and DC. RvE1 decreases DC chemotaxis in response to CCL21 and CCL19. 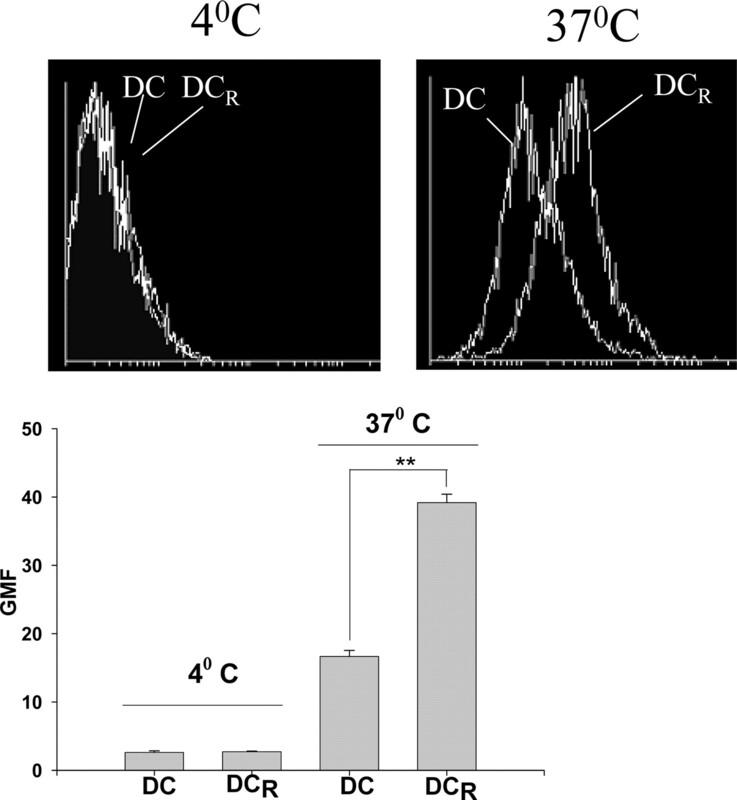 A, DC and DCR-RvE1 were stimulated with LPS (100 ng/ml) for 48 h. Migration of 5 × 105 DC in response to CCL21 and CCL19 (200 ng/ml), or to CCL3 and CCL5 (100 ng/ml) was determined in a 5-h Transwell chemotaxis assay. ∗, p < 0.05 for DC compared with DCR-RvE1. B, Migration of 5 × 105 DC toward 100 ng/ml CXCL12 was used as control. Data represent mean ± SEM of triplicate determinations. One representative experiment is shown of three independent experiments. C, CCR5 and CCR7 mRNA expression in DC and DCR-RvE1 in the absence or presence of LPS (100 ng/ml) using RT-PCR. DC and DCR-RvE1 were stimulated with LPS (100 ng/ml) for 12 h and receptor expression was assessed using semiquantitative RT-PCR. The migratory pattern is supported by the CCR5/CCR7 expression in DC as determined by RT-PCR. As expected, immature DC express CCR5, and up-regulate CCR7 expression upon maturation (Fig. 5⇑C). In contrast, DCR-RvE1 do not change the chemokine expression pattern following LPS stimulation, i.e., continue to express CCR5 and do not up-regulate CCR7 (Fig. 5⇑C). This response is consistent with the migration pattern (Fig. 5⇑A) and suggests that DC generated in the presence of RvE1 do not migrate to lymph nodes but remain at the inflammatory site. Given the chemotactic properties of DCR-RvE1, they are more likely to interact with effector T cells in the periphery rather than naive T cells in lymph node. DC with immunosuppressive properties have a weak capacity to induce T cell proliferation. We investigated the ability of DCR-RvE1 to induce proliferation of Ag-activated CD4+ T cells. Naive PCCF-specific Tg CD4+ T cells (5 × 105 cells/well) were stimulated with syngeneic (B10.A) DC pulsed with PCCF, followed by CD4+ T cell purification 3 days later. The purified T cells were rested for 2–4 days in complete medium supplemented with 50 IU/ml of IL-2 before restimulation with PCCF-pulsed DC or DCR-RvE1. In contrast to DC, DCR-RvE1 stimulated with LPS or unstimulated induce weak T cell proliferation (Fig. 6⇓A). This effect is consistent with the low expression of costimulatory molecules on DCR-RvE1 (Fig. 1⇑). DCR-RvE1 are poor stimulators of activated T cells and do not induce CD4+Foxp3+ T cells. A, Activated T cells were generated from PCCF-specific Tg spleen cells cultured with DC pulsed with PCCF for 3 days, followed by purification and resting in IL-2 for 2–4 days. Activated T cells (5 × 105 cells/well) were then cocultured with a different number of DC or DCR-RvE1 untreated (left) or LPS-treated (right) and pulsed with PCCF (5 μM). Proliferation was determined 4 days later using BrdU incorporation. Cultures without DC served as controls and did not proliferate. Each result shows mean ± SEM of three experiments performed in duplicate. B, DC and DCR-RvE1 were cultured with LPS for 48 h, washed, pulsed with PCCF or OVA (10 μg/ml) as control, and added (5 × 104 cells/well) to activated PCCF-specific CD4+ T cells (5 × 105 cells/well). At 48 h later, the levels of secreted cytokines were determined by ELISA. Cells cultured with the irrelevant Ag (OVA) did not produce cytokines above detection levels: <50 pg/ml IFN-γ, <40 pg/ml IL-4, <45 pg/ml TGF-β1, <20 pg/ml IL-10, and <0.1 ng/ml IL-17. Each result shows mean ± SEM of three experiments performed in duplicate. ∗, p < 0.05. C, DC and DCR were cultured with LPS for 48 h, washed, and added (5 × 105 cells/well) to activated PCCF-specific CD4+ T cells (5 × 106 cells/well) in the presence of PCCF or OVA. Cocultures were collected at 72 h, stained for surface CD4 and CD25 and for intracellular Foxp3, and analyzed by flow cytometry. Histograms show mean percentage ± SEM of Foxp3+ expressing cells after gating on live lymphocytes (G1), followed by CD4+CD25+ gating (G2). One representative experiment of three experiments is shown. Tolerogenic DC have been previously shown to inhibit T cell proliferation through the induction of Treg. Most Treg are characterized by CD25 and Foxp3 expression, and for some subsets by increased IL-10 or TGFβ production (33). We evaluated first the effect of DCR-RvE1 on activated T cells in terms of cytokine production, by coculturing DC or DCR-RvE1 pulsed with specific Ag (PCCF) or nonspecific Ag (OVA, control) with preactivated PCCF-specific CD4+ T cells. Exposure of T cells to DCR-RvE1 resulted in a reduction of all cytokines tested, i.e., IL-10, IL-17, TGF-β1, IL-4, and IFN-γ (Fig. 6⇑B). This exposure eliminated the possibility of IL-10/TGFβ-producing Treg. In addition, we did not observe any increase in Foxp3 expression in the CD4+CD25+ T cell population following coculture with DCR-RvE1 (Fig. 6⇑C). Given the decreased production of all cytokines tested in cocultures of PCCF-pulsed DCR-RvE1 with activated T cells, we considered the possibility that DCR-RvE1 may cause T cell apoptosis. DCR-RvE1 or DC pulsed with PCCF (specific Ag) or OVA (nonspecific Ag) were cocultured with PCCF-specific activated T cells for 5 days. Activated T cells cultured in the absence of DCR-RvE1/DC were used as control. A low percentage of annexin V/PI-positive cells were observed in DC and PCCF T cell cultures (Fig. 7⇓, A and B). In contrast, cultures containing DCR-RvE1 and PCCF T cell cultures had a significant number of both apoptotic (annexin V+PI+) and late apoptotic or necrotic (annexin V+PI+) cells (22% and 28%, respectively) (Fig. 7⇓, A and B). DCR-RvE1 induce apoptosis of activated CD4+ T cells. A, DC and DCR-RvE1 were cultured with LPS for 48 h, pulsed with PCCF or OVA, and added (5 × 104 cells/well) to preactivated PCCF-specific CD4+ T cells (5 × 105 cells/well). Five days later, the apoptotic status of T cells was assessed using flow cytometry (annexin V/PI staining). Preactivated T cells cultured with PCCF in the absence of DC or DCR-RvE1 were used as controls (quadrant values are percentage of cells). B, Results are expressed as a percentage of apoptotic/necrotic cells (top right and bottom right quadrants), which show mean ± SEM of three experiments performed in duplicate. ∗∗, p < 0.01. C, DC and DCR-RvE1 were cultured with LPS and pulsed with PCCF for 48 h, washed, and added (5 × 104 cells/well) to purified preactivated syngeneic PCCF-specific CD4+ T cells (5 × 105 cells/well) in the presence of neutralizing anti-IL-10 Abs (5 μg/well) or control IgG. Five days later T cell apoptosis was determined by annexin V/PI staining. Activated T cells in the presence of PCCF were used as control. Results are expressed as a percentage of apoptotic/necrotic cells (top right and bottom right quadrants) and show mean ± SEM of three experiments performed in duplicate. ∗, p < 0.05. D, Splenic DC were isolated from B10.A mice with anti-CD11c microbeads and cultured for 48 h in the presence or absence of RvE1, followed by LPS for 24 h. After extensive washing, DC (5 × 103 cells/well) were added to purified preactivated syngeneic PCCF-specific CD4+ T cells (5 × 104 cells/well) in the presence of PCCF or OVA. Five days later T cell apoptosis was determined by annexin V/PI staining. Activated T cells in the presence of PCCF were used as control. Results are expressed as a percentage of apoptotic cells and show mean ± SEM of three experiments performed in duplicate. ∗∗, p < 0.01. Because DCR-RvE1 produce higher levels of IL-10 compared with regular DC, we assessed the possible role of IL-10 in T cell apoptosis. Neutralizing anti-IL-10 Abs increased rather than decreased T cell apoptosis (Fig. 7⇑C), indicating that DCR-RvE1-induced apoptosis in Ag-restimulated T cells is not mediated through IL-10. In vivo, splenic resident CD8α+ conventional DC were reported to induce Fas- and IDO-mediated apoptosis of T cells (34, 35). We assessed the capacity of ex vivo RvE1-treated splenic DC to induce apoptosis in restimulated T cells. Purified B10.A splenic CD11c+ DC were exposed to RvE1 for 48 h, followed by LPS stimulation, pulsing with either PCCF (specific Ag) or OVA (nonspecific Ag), and cocultured with previously activated PCCF-specific Tg T cells. T cell apoptosis was determined by annexin V/PI staining. Similar to bone marrow-derived DC generated in the presence of RvE1, splenic DC treated with RvE1 induced significant levels of apoptosis compared with untreated DC (35% vs 15%) (Fig. 7⇑D). In an effort to determine the mechanisms through which DC generated in the presence of RvE1 induce apoptosis in effector T cells, expression of IDO was assessed. IDO is an enzyme that catabolizes the amino acid tryptophan and plays an important role in T cell apoptosis, based in part on the high susceptibility of T cells to the lack of tryptophan (27). We treated DC and DCR-RvE1 with LPS for 72 h and measured IDO expression by Western blot analysis. We observed a significant level of IDO expression in DCR-RvE1, whereas no IDO was detected in control DC (Fig. 8⇓A). Because IDO expression does not necessarily correlate with enzymatic activity, we determined the effects of DCR-RvE1 on activated T cells in the presence and absence of the IDO inhibitor 1-methyl-l-tryptophan. In the presence of the IDO inhibitor, DCR-RvE1-induced T cell apoptosis was reduced to levels similar to those observed for DC not exposed to RvE1 (Fig. 8⇓B), confirming that the effect of DCR-RvE1 was mediated through IDO. Apoptosis of activated T cells is mediated through IDO. A, IDO expression in DC and DCR-RvE1 treated with or without LPS for 48 h was determined by Western blot using a monoclonal anti-mouse IDO Ab (20 μg protein/lane). One representative blot of three separate experiments is shown. 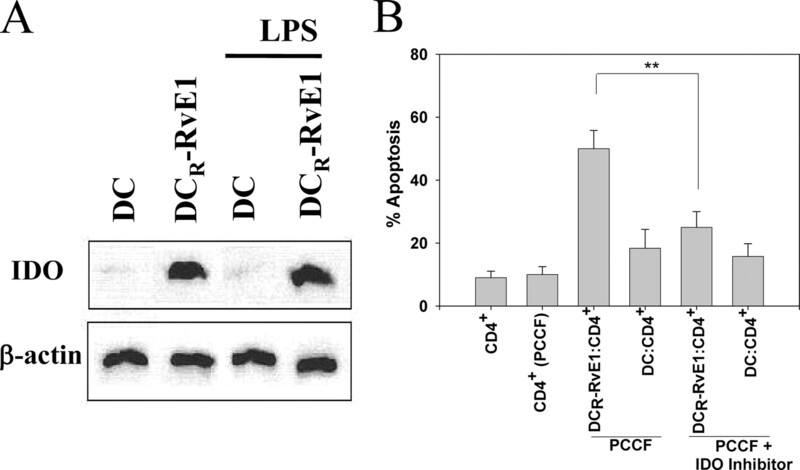 B, DC and DCR-RvE1 cultured with LPS for 48 h were added (5 × 104 cells/well) to activated PCCF-specific CD4+ T cells (5 × 105 cells/well) in the presence or absence of 1-methyl-l-tryptophan (200 μM). Five days later, T cell apoptosis was determined by annexin V/PI staining. Results are expressed as a percentage of apoptotic/necrotic cells and show mean ± SEM of three experiments performed in duplicate. ∗∗, p < 0.01. Previous studies demonstrated the in vivo presence of resolvins and protectins in inflammatory exudates, especially during the resolution phase. The mechanisms described in this study that account for the proresolution role of resolvins include inhibition of leukocyte infiltration and reduction in proinflammatory cytokines and chemokines. In this study, we propose a new mechanism, which involves DC and effector T cells. We show that DC generated in the presence of RvE1 do not up-regulate costimulatory molecules and proinflammatory cytokines following TLR signaling, while secreting higher levels of IL-10, are poor T cell stimulators, inhibit T cell-derived cytokine production, and increase apoptosis of Ag-activated Ag T cells. Acute inflammation represents a critical protective mechanism leading to the elimination of pathogens. However, unsuccessful resolution of an acute inflammatory process can lead to chronic inflammation and subsequent tissue destruction and functional impairment (36, 37, 38). Recent studies established that the resolution of acute inflammation is an active rather than a passive event, which requires a significant reduction in the number of infiltrating leukocytes, reduction in the levels of proinflammatory chemokines, a shift from proinflammatory to anti-inflammatory cytokines, and apoptosis of activated leukocytes (39, 40, 41). Recently, several classes of lipid mediators, i.e., lipoxins derived from arachidonic acid, and resolvins and protectins derived from the omega-3 polyunsaturated fatty acids EPA and DHA, were shown to play essential roles in the resolution of an acute inflammatory process (reviewed in Ref. 3). The E-series resolvins RvE1 and RvE2 are generated from EPA by acetylated COX2 and cytochrome P450 of microbial origin or released from vascular endothelial cells or mucosal epithelial cells. The D-series resolvins and protectins are generated from DHA by acetylated COX2 or via lipoxygenases (3). Both resolvins and protectins block PMN infiltration in models of acute inflammation including dermal air pouch inflammation, peritonitis, colitis, and periodontitis (7, 11, 12, 14, 32, 42, 43, 44, 45). Effector CD4+ T cells, primarily Th1/Th17 effectors, are major participants in inflammatory processes. Three major mechanisms have been described in terms of CD4+ T cell involvement in the resolution of an inflammatory response, i.e., the switch from Th1 to Th2 effectors, the generation of Treg and the elimination of effector T cells through apoptosis. DC have been shown to induce a preferential switch to Th2 effectors in models of Leishmania major and Chlamydia muridarum infections, or following exposure to endogenous alarmins (46, 47, 48). In addition, tolerogenic DC have been shown to induce the generation of Ag-specific Treg (reviewed in Refs. 49, 50, 51). Participation of DC in both the Th2 shift and Treg induction requires interactions with naive CD4+ T cells occurring in secondary lymphoid organs, primarily lymph nodes. In contrast, the resolution of a local inflammatory process usually occurs at sites different from lymph nodes and spleen and involves effector rather than naive T cells. In comparison with the role of DC in initiating an immune response and inducing/maintaining tolerance, much less is known about the possible DC role in the resolution of an inflammatory process. Although numerous studies identified and characterized the omega-3 fatty acid-derived metabolites present in inflammatory sites and established their inhibitory effect on PMN migration and infiltration, little is known about their effects on specific immune cell subsets, including DC. Recent studies showed that murine splenic DC express the ChemR23 receptor, which mediates RvE1-induced inhibition of IL-12p40 secretion (14), and that human monocyte-derived DC treated or differentiated in the presence of EPA or DHA are resistant to LPS-induced up-regulation of costimulatory molecules and TNF-α and IL-12 production (51, 52). In this study, we show that DC treated with RvE1 differentiate into a subset of DC, which share some characteristics with tolerogenic DC, but maintain an immature chemokine receptor pattern and induce apoptosis of activated Ag-specific T cells. Exposure to RvE1 during DC differentiation prevents the up-regulation of costimulatory molecules following LPS stimulation, and changes the cytokine profile, reducing TNF-α and IL-12p70 and up-regulating IL-10 production. It is presently not clear how exposure to RvE1 during DC differentiation inhibits the capacity to express costimulatory molecules and proinflammatory cytokine genes, especially because exposure to RvE1 does not affect TLR4 expression. One possibility is the sustained induction of known inhibitors of signaling pathways such as IRAK-M, IκB, or SOCS proteins. As an example, lipoxin A4 and aspirin-triggered lipoxin have been reported to exert their anti-inflammatory activity through induction of SOCS-2 (53). As mentioned, DC generated in the presence of RvE1 share some of the features described for tolerogenic DC, such as low expression of costimulatory molecules, low IL-12p70 and high IL-10 production, resistance to maturation through TLR signaling, and low stimulatory capacity for Ag-specific T cells (reviewed in Refs. 23, 25). However, in contrast to most tolerogenic or mature immunogenic DC, DC generated in the presence of RvE1 and stimulated through TLR4 do not switch their chemokine receptor profile from CCR5 to CCR7, continue to migrate in response to proinflammatory chemokines such as CCL3, CCL4, and CCL5, and do not gain the ability to migrate in response to the lymph node derived chemokines CCL19/21. This strongly suggests that DC exposed to RvE1 continue to reside at the inflammatory site instead of migrating to neighboring lymph nodes. Sustained expression of the CCR5 receptor might also explain previous reports of RvE1 inhibition of DC migration into splenic T cell areas (14). The effect of RvE1 on DC migration is in contrast to the effects of proinflammatory lipid mediators such as PGE2 and leukotrienes (54, 55, 56). PGE2 in particular has been reported to be an essential factor for mature DC migration to lymph nodes through the facilitation of CCR7 signaling, inactivation of β1 integrins and podosome dissolution, and induction or activation of matrix metalloproteinase-9 (57, 58, 59). As residents in inflammatory sites, DCs exposed to RvE1 could perform two different functions. First, based on their high endocytic capacity, they could contribute to Ag clearing, resulting in a decreased Ag load, and therefore facilitating the resolution phase. In contrast, they might affect incoming Ag-specific effector T cells, leading to the generation of Treg, elimination of effector T cells, or both. Our results indicate that Ag-activated T cells cocultured with DCs exposed to RvE1 proliferate poorly, show a significant decrease in IL-17, IFN-γ, IL-4, as well as IL-10 and TGFβ production, and show no increase in the number of Foxp3+ T cells. This indication argues against DCR-RvE1 as important contributors to Treg induction. In contrast, ∼50% of the effector T cells undergo apoptosis or necrosis when exposed to DCR-RvE1 pulsed with specific Ag (PCCF). Subsets of DC previously described as cytotoxic for T cells were shown to express functional IDO (reviewed in Refs. 27, 60). In contrast to regular DC, DCR-RvE1 express IDO before and after LPS stimulation, and the cytotoxic activity of DCR-RvE1 is abolished in the presence of the IDO inhibitor 1-methyl-l-tryptophan. These results strongly suggest that exposure to RvE1 induces IDO expression in DC, and that the active IDO enzyme plays an essential role in the killing of effector T cells. The fact that ex vivo exposure of splenic DC to RvE1 also results in increased apoptosis of activated T cells supports the physiological role of omega-3 fatty acid metabolites in DC-mediated resolution of inflammation. This report is the first on IDO induction in DC by an omega-3 fatty acid-derived metabolite (RvE1). Previously it has been reported that another lipid mediator PGE2 also induces the expression of IDO protein in human monocyte-derived DC, but that additional signals provided by the TNFR or TLR signaling are required for the activation of the IDO enzyme (29, 30). Because the role of IDO was established with DCR-RvE1 treated with LPS before coculture with effector T cells, it is possible that, similar to PGE2, both RvE1 and TLR signaling are required for the generation of the active IDO enzyme. In conclusion, we propose that resolvins stimulate the resolution phase of inflammation through mechanisms that include effects on DC (Fig. 9⇓). During an inflammatory process, in addition to the existing steady-state DC, newly recruited pre-DC undergo final differentiation in the inflammatory milieu. The functional state of the differentiating DC depends to a large degree on the local environmental factors (reviewed in Ref. 26). In early stages of inflammation, migratory DC differentiate following transendothelial migration in an inflammatory milieu consisting of proinflammatory cytokines, chemokines, and PGE2. We reported previously that DC differentiated in the presence of PGE2 are highly inflammatory and induce preferential Th17 differentiation (61). The proinflammatory DC up-regulate CCR7 in response to TLR ligands and migrate to lymph nodes where they activate naive T cells and provide cytokines required for T cell proliferation/differentiation. In later stages of inflammation, incoming DC undergo final differentiation in the presence of resolvins and protectins. EPA and DHA measurements in vivo in a peritonitis model resulted in levels corresponding to a concentration of metabolites in the range from 10−7 to 10−8 M (7). 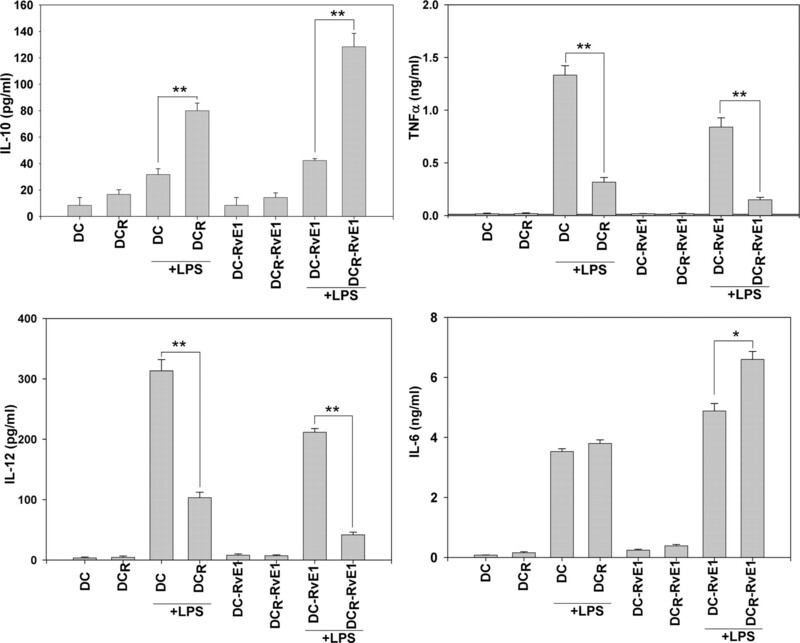 We propose that DC undergoing final differentiation in the presence of omega-3 fatty acid metabolites such as DCR-RvE1 represent regulatory DC characterized by resistance to subsequent TLR stimulation in terms of costimulatory molecule expression and proinflammatory cytokine production, and by the release of high levels of IL-10. In contrast to immunogenic and most of the tolerogenic DC, DCR-RvE1 continue to express CCR5 following TLR signaling, and therefore are retained at the inflammation site where they induce IDO-mediated cell death of Ag-specific effector T cells. The local elimination of Ag-specific effector T cells by DCR-RvE1 following pathogen clearing contributes to the resolution of the inflammatory process, and represents an additional mechanism for the proresolving effect of lipid mediators such as resolvins. Inflammatory and regulatory DC are generated in vivo during early and late stages of inflammation, respectively. Left, Early stage migratory DC differentiate from CX3CR1low blood monocytes following transendothelial migration into the inflammatory site. DC final differentiation occurs in a proinflammatory milieu characterized by proinflammatory cytokines, chemokines, and PGE2. Following TLR signaling, the inflammatory DC secrete proinflammatory cytokines and chemokines, up-regulate CCR7, and migrate to lymph nodes where they activate cognate naive T cells. Resulting effector CD4+ T cells migrate back into the inflammatory site and further augment inflammation by activating infiltrating macrophages and PMNs. Right, Late stage the inflammatory site composition changes from proinflammatory to anti-inflammatory molecules, including IL-10, resolvins, and protectins. Incoming CX3CR1low blood monocytes differentiate in the presence of resolvins and protectins into regulatory DC characterized by high IL-10 secretion, low capacity to activate T cells, continued expression of CCR5, and up-regulation of IDO expression. The CCR5+ regulatory DC continue to reside at the inflammatory site and induce IDO-mediated apoptosis in incoming Ag-specific effector CD4+ T cells. ↵1 This work was supported by Grant R01AI052306 from the National Institute of Allergy and Infectious Diseases, National Institutes of Health (to D.G.) and a grant from the Office of Research and Sponsored Programs of Kean University (to E.K.V.). ↵3 Abbreviations used in this paper: EPA, eicosapentaenoic acid; DHA, docosahexaenoic acid; COX, cyclooxygenase; DC, dendritic cell; PCCF, pigeon cytochrome c fragment; Treg, regulatory T cell; Tg, transgenic; IDO, indoleamine 2,3-dioxygenase; PI, propidium iodide; PMN, polymorphonuclear cell; RvE1, resolvin E1. Das, U. N.. 2006. Essential fatty acids: biochemistry, physiology and pathology. Biotechnol. J. 1: 420-439. Ariel, A., C. N. Serhan. 2007. Resolvins and protectins in the termination program of acute inflammation. Trends Immunol. 28: 176-183. Serhan, C. N., S. Yacoubian, R. Yang. 2008. Anti-inflammatory and proresolving lipid mediators. Annu. Rev. Pathol. 3: 279-312. Belluzzi, A.. 2004. Polyunsaturated fatty acids (n-3 PUFAs) and inflammatory bowel disease (IBD): pathogenesis and treatment. Eur. Rev. Med. Pharmacol. Sci. 8: 225-229. Freedman, S. D., P. G. Blanco, M. M. Zaman, J. C. Shea, M. Ollero, I. K. Hopper, D. A. Weed, A. Gelrud, M. M. Regan, M. Laposata, et al 2004. Association of cystic fibrosis with abnormalities in fatty acid metabolism. N. Engl. J. Med. 350: 560-569. Harris, W. S., M. Miller, A. P. Tighe, M. H. Davidson, E. J. Schaefer. 2008. Omega-3 fatty acids and coronary heart disease risk: clinical and mechanistic perspectives. Atherosclerosis 197: 12-24. Bannenberg, G. L., N. Chiang, A. Ariel, M. Arita, E. Tjonahen, K. H. Gotlinger, S. Hong, C. N. Serhan. 2005. Molecular circuits of resolution: formation and actions of resolvins and protectins. J. Immunol. 174: 4345-4355. Flower, R. J., M. Perretti. 2005. Controlling inflammation: a fat chance?. J. Exp. Med. 201: 671-674. Schwab, J. M., N. Chiang, M. Arita, C. N. Serhan. 2007. Resolvin E1 and protectin D1 activate inflammation-resolution programmes. Nature 447: 869-874. Serhan, C. N., K. Gotlinger, S. Hong, M. Arita. 2004. Resolvins, docosatrienes, and neuroprotectins, novel omega-3-derived mediators, and their aspirin-triggered endogenous epimers: an overview of their protective roles in catabasis. Prostaglandins Other Lipid Mediat. 73: 155-172. Serhan, C. N., S. Hong, K. Gronert, S. P. Colgan, P. R. Devchand, G. Mirick, R. L. Moussignac. 2002. Resolvins: a family of bioactive products of omega-3 fatty acid transformation circuits initiated by aspirin treatment that counter proinflammation signals. J. Exp. Med. 196: 1025-1037. Tjonahen, E., S. F. Oh, J. Siegelman, S. Elangovan, K. B. Percarpio, S. Hong, M. Arita, C. N. Serhan. 2006. Resolvin E2: identification and anti-inflammatory actions: pivotal role of human 5-lipoxygenase in resolvin E series biosynthesis. Chem. Biol. 13: 1193-1202. Arita, M., C. B. Clish, C. N. Serhan. 2005. The contributions of aspirin and microbial oxygenase to the biosynthesis of anti-inflammatory resolvins: novel oxygenase products from omega-3 polyunsaturated fatty acids. Biochem. Biophys. Res. Commun. 338: 149-157. Arita, M., F. Bianchini, J. Aliberti, A. Sher, N. Chiang, S. Hong, R. Yang, N. A. Petasis, C. N. Serhan. 2005. Stereochemical assignment, antiinflammatory properties, and receptor for the omega-3 lipid mediator resolvin E1. J. Exp. Med. 201: 713-722. Arita, M., M. Yoshida, S. Hong, E. Tjonahen, J. N. Glickman, N. A. Petasis, R. S. Blumberg, C. N. Serhan. 2005. Resolvin E1, an endogenous lipid mediator derived from omega-3 eicosapentaenoic acid, protects against 2,4,6-trinitrobenzene sulfonic acid-induced colitis. Proc. Natl. Acad. Sci. USA 102: 7671-7676. Hasturk, H., A. Kantarci, E. Goguet-Surmenian, A. Blackwood, C. Andry, C. N. Serhan, T. E. Van Dyke. 2007. Resolvin E1 regulates inflammation at the cellular and tissue level and restores tissue homeostasis in vivo. J. Immunol. 179: 7021-7029. Weylandt, K. H., J. X. Kang, B. Wiedenmann, D. C. Baumgart. 2007. Lipoxins and resolvins in inflammatory bowel disease. Inflamm. Bowel Dis. 13: 797-799. Campbell, E. L., N. A. Louis, S. E. Tomassetti, G. O. Canny, M. Arita, C. N. Serhan, S. P. Colgan. 2007. Resolvin E1 promotes mucosal surface clearance of neutrophils: a new paradigm for inflammatory resolution. FASEB J. 21: 3162-3170. Steinman, R. M.. 2006. Linking innate to adaptive immunity through dendritic cells. Novartis Found. Symp. 279: 101-113. Steinman, R. M.. 2007. Dendritic cells: understanding immunogenicity. Eur. J. Immunol. 37: (Suppl. 1):S53-S60. Cools, N., P. Ponsaerts, V. F. Van Tendeloo, Z. N. Berneman. 2007. Balancing between immunity and tolerance: an interplay between dendritic cells, regulatory T cells, and effector T cells. J. Leukocyte Biol. 82: 1365-1374. Mahnke, K., T. S. Johnson, S. Ring, A. H. Enk. 2007. Tolerogenic dendritic cells and regulatory T cells: a two-way relationship. J. Dermatol. Sci. 46: 159-167. Shortman, K., S. H. Naik. 2007. Steady-state and inflammatory dendritic-cell development. Nat. Rev. Immunol. 7: 19-30. Braun, D., R. S. Longman, M. L. Albert. 2005. A two-step induction of indoleamine 2,3 dioxygenase (IDO) activity during dendritic-cell maturation. Blood 106: 2375-2381. Munn, D. H., M. D. Sharma, J. R. Lee, K. G. Jhaver, T. S. Johnson, D. B. Keskin, B. Marshall, P. Chandler, S. J. Antonia, R. Burgess, et al 2002. Potential regulatory function of human dendritic cells expressing indoleamine 2,3-dioxygenase. Science 297: 1867-1870.
von Bergwelt-Baildon, M. S., A. Popov, T. Saric, J. Chemnitz, S. Classen, M. S. Stoffel, F. Fiore, U. Roth, M. Beyer, S. Debey, et al 2006. CD25 and indoleamine 2,3-dioxygenase are up-regulated by prostaglandin E2 and expressed by tumor-associated dendritic cells in vivo: additional mechanisms of T-cell inhibition. Blood 108: 228-237. Delgado, M., E. Gonzalez-Rey, D. Ganea. 2005. The neuropeptide vasoactive intestinal peptide generates tolerogenic dendritic cells. J. Immunol. 175: 7311-7324. Arita, M., T. Ohira, Y. P. Sun, S. Elangovan, N. Chiang, C. N. Serhan. 2007. Resolvin E1 selectively interacts with leukotriene B4 receptor BLT1 and ChemR23 to regulate inflammation. J. Immunol. 178: 3912-3917. Fallarino, F., C. Vacca, C. Orabona, M. L. Belladonna, R. Bianchi, B. Marshall, D. B. Keskin, A. L. Mellor, M. C. Fioretti, U. Grohmann, P. Puccetti. 2002. Functional expression of indoleamine 2,3-dioxygenase by murine CD8α+ dendritic cells. Int. Immunol. 14: 65-68. Suss, G., K. Shortman. 1996. A subclass of dendritic cells kills CD4 T cells via Fas/Fas-ligand-induced apoptosis. J. Exp. Med. 183: 1789-1796. McInnes, I. B., G. Schett. 2007. Cytokines in the pathogenesis of rheumatoid arthritis. Nat. Rev. Immunol. 7: 429-442. Williams, R. O., E. Paleolog, M. Feldmann. 2007. Cytokine inhibitors in rheumatoid arthritis and other autoimmune diseases. Curr. Opin. Pharmacol. 7: 412-417. Yacoubian, S., C. N. Serhan. 2007. New endogenous anti-inflammatory and proresolving lipid mediators: implications for rheumatic diseases. Nat. Clin. Pract. Rheumatol. 3: 570-579. Homey, B., M. Steinhoff, T. Ruzicka, D. Y. Leung. 2006. Cytokines and chemokines orchestrate atopic skin inflammation. J. Allergy Clin. Immunol. 118: 178-189. Johnson, L. A., S. Clasper, A. P. Holt, P. F. Lalor, D. Baban, D. G. Jackson. 2006. An inflammation-induced mechanism for leukocyte transmigration across lymphatic vessel endothelium. J. Exp. Med. 203: 2763-2777. Hasturk, H., A. Kantarci, T. Ohira, M. Arita, N. Ebrahimi, N. Chiang, N. A. Petasis, B. D. Levy, C. N. Serhan, T. E. Van Dyke. 2006. RvE1 protects from local inflammation and osteoclast- mediated bone destruction in periodontitis. FASEB J. 20: 401-403. Hudert, C. A., K. H. Weylandt, Y. Lu, J. Wang, S. Hong, A. Dignass, C. N. Serhan, J. X. Kang. 2006. Transgenic mice rich in endogenous omega-3 fatty acids are protected from colitis. Proc. Natl. Acad. Sci. USA 103: 11276-11281. Serhan, C. N., C. B. Clish, J. Brannon, S. P. Colgan, N. Chiang, K. Gronert. 2000. Novel functional sets of lipid-derived mediators with antiinflammatory actions generated from omega-3 fatty acids via cyclooxygenase 2-nonsteroidal antiinflammatory drugs and transcellular processing. J. Exp. Med. 192: 1197-1204. Sun, Y. P., S. F. Oh, J. Uddin, R. Yang, K. Gotlinger, E. Campbell, S. P. Colgan, N. A. Petasis, C. N. Serhan. 2007. Resolvin D1 and its aspirin-triggered 17R epimer: stereochemical assignments, anti-inflammatory properties, and enzymatic inactivation. J. Biol. Chem. 282: 9323-9334. Kaiko, G. E., S. Phipps, D. K. Hickey, C. E. Lam, P. M. Hansbro, P. S. Foster, K. W. Beagley. 2008. Chlamydia muridarum infection subverts dendritic cell function to promote Th2 immunity and airways hyperreactivity. J. Immunol. 180: 2225-2232. Suzue, K., S. Kobayashi, T. Takeuchi, M. Suzuki, S. Koyasu. 2008. Critical role of dendritic cells in determining the Th1/Th2 balance upon Leishmania major infection. Int. Immunol. 20: 337-343. Yang, D., Q. Chen, S. B. Su, P. Zhang, K. Kurosaka, R. R. Caspi, S. M. Michalek, H. F. Rosenberg, N. Zhang, J. J. Oppenheim. 2008. Eosinophil-derived neurotoxin acts as an alarmin to activate the TLR2-MyD88 signal pathway in dendritic cells and enhances Th2 immune responses. J. Exp. Med. 205: 79-90. Hubert, P., N. Jacobs, J. H. Caberg, J. Boniver, P. Delvenne. 2007. The cross-talk between dendritic and regulatory T cells: good or evil?. J. Leukocyte Biol. 82: 781-794. Loser, K., S. Beissert. 2007. Dendritic cells and T cells in the regulation of cutaneous immunity. Adv. Dermatol. 23: 307-333. Wang, H., Q. Hao, Q. R. Li, X. W. Yan, S. Ye, Y. S. Li, N. Li, J. S. Li. 2007. 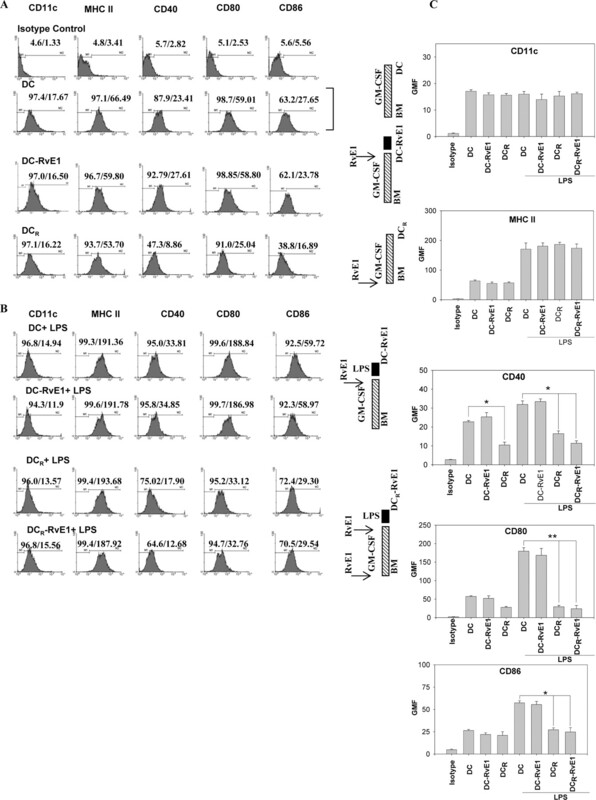 Omega-3 polyunsaturated fatty acids affect lipopolysaccharide-induced maturation of dendritic cells through mitogen-activated protein kinases p38. Nutrition 23: 474-482. Zeyda, M., M. D. Saemann, K. M. Stuhlmeier, D. G. Mascher, P. N. Nowotny, G. J. Zlabinger, W. Waldhausl, T. M. Stulnig. 2005. Polyunsaturated fatty acids block dendritic cell activation and function independently of NF-κB activation. J. Biol. Chem. 280: 14293-14301. Machado, F. S., J. E. Johndrow, L. Esper, A. Dias, A. Bafica, C. N. Serhan, J. Aliberti. 2006. Anti-inflammatory actions of lipoxin A4 and aspirin-triggered lipoxin are SOCS-2 dependent. Nat. Med. 12: 330-334. Del Prete, A., W. H. Shao, S. Mitola, G. Santoro, S. Sozzani, B. Haribabu. 2007. Regulation of dendritic cell migration and adaptive immune response by leukotriene B4 receptors: a role for LTB4 in up-regulation of CCR7 expression and function. Blood 109: 626-631. Doepping, S., C. D. Funk, A. J. Habenicht, R. Spanbroek. 2007. Selective 5-lipoxygenase expression in Langerhans cells and impaired dendritic cell migration in 5-LO-deficient mice reveal leukotriene action in skin. J. Invest. Dermatol. 127: 1692-1700. Luft, T., M. Jefford, P. Luetjens, T. Toy, H. Hochrein, K. A. Masterman, C. Maliszewski, K. Shortman, J. Cebon, E. Maraskovsky. 2002. Functionally distinct dendritic cell (DC) populations induced by physiologic stimuli: prostaglandin E2 regulates the migratory capacity of specific DC subsets. Blood 100: 1362-1372. Scandella, E., Y. Men, D. F. Legler, S. Gillessen, L. Prikler, B. Ludewig, M. Groettrup. 2004. 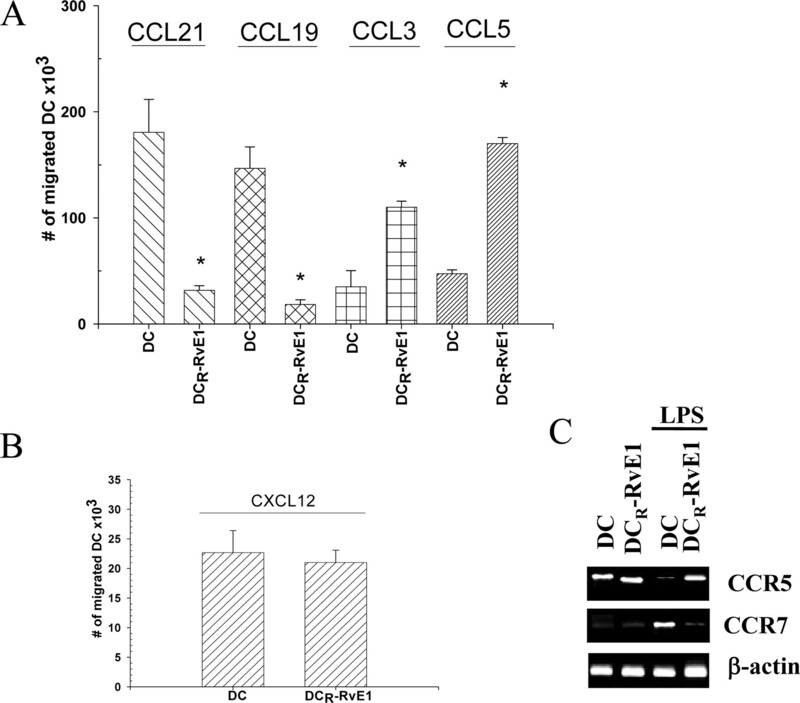 CCL19/CCL21-triggered signal transduction and migration of dendritic cells requires prostaglandin E2. Blood 103: 1595-1601.
van Helden, S. F., D. J. Krooshoop, K. C. Broers, R. A. Raymakers, C. G. Figdor, F. N. van Leeuwen. 2006. A critical role for prostaglandin E2 in podosome dissolution and induction of high-speed migration during dendritic cell maturation. J. Immunol. 177: 1567-1574. Yen, J. H., T. Khayrullina, D. Ganea. 2008. PGE2-induced metalloproteinase-9 is essential for dendritic cell migration. Blood 111: 260-270. Popov, A., J. L. Schultze. 2008. IDO-expressing regulatory dendritic cells in cancer and chronic infection. J. Mol. Med. 86: 145-160. Khayrullina, T., J. H. Yen, H. Jing, D. Ganea. 2008. In vitro differentiation of dendritic cells in the presence of prostaglandin E2 alters the IL-12/IL-23 balance and promotes differentiation of Th17 cells. J. Immunol. 181: 721-735.